As with any civilian job, Army officers must meet specified criteria in order to be eligible for promotion. The Department of Defense calls for a given number of officers based on manpower needs and skill requirements for each category and grade. So what is the career path for an Army officer? Here are some of the criteria and requirements that need to be met. This is a 12-week program for ​enlisted soldiers, civilian college graduates and direct commission candidates (which include doctors and chaplains). 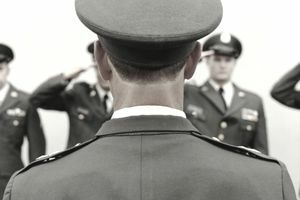 Those who complete Officer Candidate School (OCS) become commissioned officers upon graduation and must serve at least three years on active duty following graduation. The Army's Officer Candidate School is located at Fort Benning in Georgia. Roughly 70 percent of enlisted candidates and 60 percent of those accepted overall successfully complete Army OCS. Two of the biggest factors influencing officer promotions are time in service (TIS) and time in grade (TIG). Time in service is the total time in which someone is in the Army. An officer must spend a given amount of time in each grade prior to advancement to the next and he or she typically can't skip grades. The minimum TIG requirements for promotion to the next higher grade is shown in the table below. Officers in the same competitive category will compete among themselves for promotions. Changes in authorizations, losses, and promotions to the next higher grade will create variations in both the TIS and TIG when these promotions may occur. The promotion timings are expressed in terms of the years of Active Federal Commissioned Service at which promotion occurs. The promotion opportunity is the percentage of total selects over the eligible in-the-zone population. There are three promotion opportunities in all branches of the U.S. military: Below-the-Zone, In-the-Zone, and Above-the-Zone. Below-the-Zone only applies for promotion to the rank of O-4 (Major) to O-6 (Colonel). One year before they would be eligible for In-the-Zone consideration, about 10 percent of those recommended can be promoted Below-the-Zone. Most promotions occur In-the-Zone. The selection rate for Above-the-Zone is only about 3 percent. Two other significant factors in officers promotions are fitness reports and the nature of their current and past assignments. A poor fitness report may mean being passed over for promotion. An officer whose previous assignments didn't have a significant degree of responsibility may also be passed over. For promotions beyond O-6, Army officers typically have to complete a full tour in a joint duty assignment with the Marines, Navy, Coast Guard or Air Force. And just like the other branches of the service, the mandatory retirement age for Army officers is 62 (which can be waived to 64 in some circumstances).